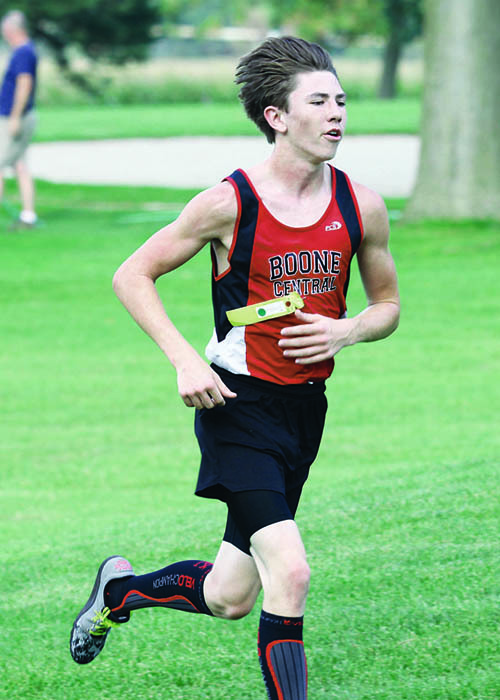 Throughout a season of splendid performances and results, Cardinal cross country fans have become accustomed to the success of Boone Central/Newman Grove’s top runners. That didn’t change Thursday at Norfolk, where the Lady Cards won a Mid-State Conference team championship and Jonny Lindgren captured an individual gold medal. Cardinal Coach Tom Dickey was certainly thrilled with that, but he seemed even more pleased with the efforts up and down his young roster of runners. “I was really proud of the kids! It was a slow course due to the dampness, but you wouldn’t have believed it!” Dickey exclaimed. “We had a bushel basket of personal bests – some by huge margins! “Riley Montoya cut 2:30 off his best, Autumn Farmer dropped over a minute, Jordan Stopak cut 1:20 off, and Abbi Huntley was near two minutes. Caleb Kohl had a fantastic race, and our top runners showed great determination and dominance. The Boone Central/Newman Grove girls set themselves up for another outstanding performance at Norfolk Skyview Lake, securing the 2017 Mid-State crown by a eight-point margin over Norfolk Catholic (29-37). Stopak paced the Cards, placing second in the race with a personal best time of 20:07 – also a Boone Central school record for the Skyview Lake course. Fellow freshman Sam Weeder was third in a personal best 20:22, frosh Autumn Simons 10th (22:21, PB) and Katie Goodwater 14th (22:40). The Boone Central/Newman Grove boys finished fourth in the competition, but no one could top another Card freshman, Lindgren, as he zipped to the gold medal in a personal best time of 17:35. Boone Central/Newman Grove had two additional top 20 finishers – Bradley Schindel 14th (18:57, PB) and Kohl 18th (19:42, PB).